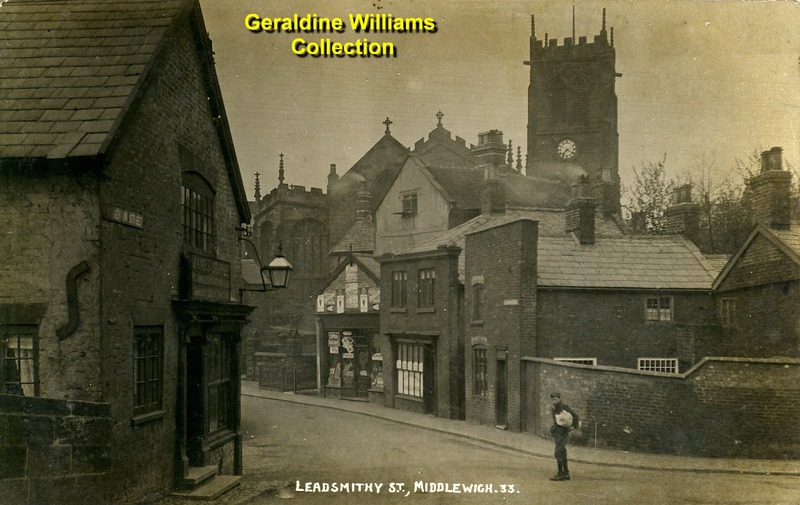 You could be forgiven for thinking that we had already shown you this classic Middlewich postcard here, but close inspection tells us that this is not the case. The lady in Edwardian dress we saw earlier is nowhere to be seen and a young gentleman carrying a large bundle of some kind (perhaps it's his washing?) is standing in the road eyeing the camera rather suspiciously. The two versions were obviously taken on different occasions but within a few years, or even months, of each other as there is very little difference between the two, except in small details. The viewpoint in the second version has been shifted slightly to the left, so that we see the left hand parapet wall of the Town Bridge, rather than the opposite one. The shop in the centre of both photos, and next to the Churchyard gate, has become festooned in advertisements (or had said advertisements removed, of course, depending on which order the pictures were taken in) and there are some differences to the windows of that strange house with the parapet frontage which we talked about in the first entry. In fact the windows shown here may have been drawn in to make them stand out, so suspiciously white are they. Re-touching, as it was called, was common practice at the time - a kind of early and very primitive version of Photoshop. The two pictures were also taken at different times of the day, judging by the shadows, and at different times of the year. In the first version, the Town Hall can just be glimpsed through the trees on the right, but in the second it is hidden behind thick vegetation. And this gives us a chance to answer an outstanding query from Geraldine Williams about the strange, spidery shadow on the wall of the house on the right in the Paul Hough version. Geraldine is wondering if it could possibly be the shadow of a telegraph pole, and I think that's precisely what it is. The telegraph system had been in operation for quite a few years when the photograph was taken and required many copper wires (far more than a modern telephone line). And, of course, even if we assume the photo to have been taken before the first war, telephones too were becoming increasingly common at that time, adding to the jumble of wires running through the streets. If you take a look at this aerial view of the area at the time you can see several tall telegraph poles with multiple cross bars on them.